A group of industrial chemicals humans started banning decades ago could cause many of the world’s orca whale populations to collapse over the next century, an alarming new study has found. Polychlorinated biphenyls, better known as PCBs, are manmade compounds once used in a range of applications from electrical appliances to household paints. They were widely banned in the 1970s and 1980s after extensive contamination of humans and the environment was uncovered. Research has since linked the chemicals to endocrine and immune system disruption and reproductive failure in vertebrates—a legacy that continues to ripple through the biosphere thanks to PCBs’ longevity and their knack for accumulating up the food chain. Nowhere is this more evident than in orca whales, apex predators that have the unfortunate tendency to hoard industrial pollutants in their blubber. PCB concentrations above 50 milligrams per kilogram of tissue are a health concern for marine mammals, yet in some orca populations numbers in the hundreds are more common. Mother whales pass the chemicals to their babies in the placenta and in their milk, transferring the toxic heritage from generation to generation. Despite all this, nobody had systematically investigated what PCBs could mean for orca whales’ futures. The new study, published Thursday in Science, did just that, and the results aren’t pretty: Out of 19 populations examined, 10 appear to be at “high risk of collapse” over the next 100 years due to PCB exposure alone. “It really was quite shocking to all of us,” lead study author Jean-Pierre Desforges, a biologist at Aarhus University, told Earther. A pod of orca whales off the coast of northern Norway. To arrive at their depressing conclusion, Desforges and his colleagues built a global database of PCB concentrations in orca whale blubber, and used prior studies of how PCBs impact reproduction and immune deficiency in whales (they used data on minke whales for reproductive effects, owing to a lack of data from orcas). This was all fed into models to look at the the accumulation and loss of PCBs in the 19 populations over the next 100 years, and to project population-level trends. 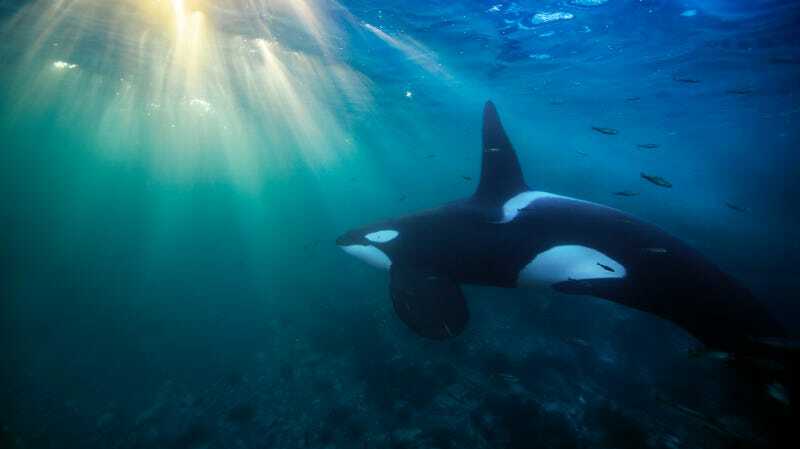 Not surprisingly, orcas living near highly industrialized areas where PCBs have leached into soil and waterways tended to be most contaminated and have a grimmer future outlook. But diet also plays an important role, as illustrated by the fact that whale populations dining primarily on marine mammals tended to have much higher PCB exposure than neighboring populations that preferred a lower food chain, fish-based diet. Five populations—the Northeast Pacific Bigg’s whales, orcas in the Strait of Gibraltar, and those in waters off Japan, Brazil, and the United Kingdom—“tend[ed] toward complete collapse” in the researchers’ models. Five more groups were also projected to decline over the next century thanks to PCBs, to say nothing of other stressors from noise pollution to overfishing. “I don’t think this is a bad approach, but it leaves no scenarios for adaptation in the 100 year simulation,” Lee said. Desforges also said that prey switching, which can happen when one food source becomes more or less abundant, could alter whales’ exposure into the future. If rapid Arctic warming drives more whales north, for instance, that could affect their diets with untold impacts on PCB exposure. Nothing is set in stone, but the findings certainly underscore the need to rid the world of these chemicals for good. The Stockholm Convention, an international treaty to reduce and eliminate persistent organic pollutants like PCBs, went into effect back in 2004. But the treaty doesn’t compel nations to stop using PCB-laden equipment until 2025, and globally, an estimated 80 percent of old PCBs have yet to be destroyed via incineration, waste-kilns, or one of many chemical decontamination methods. The pervasive use of these chemicals in paints and sealants in the 1950s and 1960s means lots of old buildings remain contaminated, too.